Pegboard POP displays continue to be a force for sales generation in the retail industry. Retail displays, as many of you undoubtedly know, account for as much as 70% of branded retail product sales. Impulse purchases drive business at astonishing rates. Fractional improvement in the performance of these displays can inevitably lead to astronomical differences in sales forecasting. Custom Pegboard POP displays maximize product placement and increase the value of retail store space. Our pegboard floor displays are available as two, three and four-sided displays. Every display has an option for a revolving base and/or a wheeled base. Standard peg hooks are available in 2” increments up to 12” and available in steel or plastic. There are many additional accessory choices that would enhance the appearance of your custom design, and most importantly, produce more sales. Using Avante factory-direct displays introduces you and your company to a wide variety of design tools to choose from that will influence user response and drive numbers. We have had countless numbers of referred clients over the years for a variety of reasons. From those referrals we’ve heard that it was our ability to communicate; our ability to take the lead on project concepts; our priority to consider sourcing eco friends materials that made Avante POP Displays their first choice for display partnership. Each of these reasons is undeniably valuable, and we appreciate each and every referral that we’ve had. But we know that above all else, the single greatest reason clients either refer or return to Avante is that your pegboard POP displays will perform! “We were all amazed at your creativity – remember that we sent you a few product samples and you came up with a new display from scratch. Our sales increased by over 300% in the 6 months after the new displays were placed in the stores. Some pegboard POP displays simply take up room. 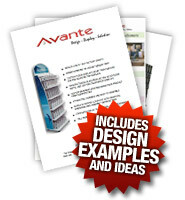 Avante creates pegboard displays that flat out produce….